I have received another handful of blog awards over the past few weeks, they are sitting here waiting for me to tell the world that someone sent me an award and for me to then pass on the love to other bloggers. I enjoy getting these little awards, I do. What I don't enjoy is having to tell everyone I received them and then having to send them to others. What about the people that don't receive awards? Does that make them less worthy? Does that put their blog in the not worth reading pile? How does one choose a blog to give an award to anyway? What is their thought process when selecting the 10 blogs that they MUST pass the award on to? I've been very up and down with my thoughts on awards and because quite frankly, the whole thing doesn't sit well with me. I don't give my children awards, an acknowledgement of a job well done yes, but awards; NO! Anyone read the book - Punished By Rewards, Alfie Kohn ? I don't blog to receive awards and whilst I truly do appreciate the time other bloggers take to let me know that they like and enjoy my blog, there are other ways to make this known. These also don't involve having to selectively choose a bunch of blogs to pass awards on to and will probably mean more to the blog owner. Things like comments, following (please make sure you have a google friends connect area on your blog so I can follow you too), subscribing to feeds, grabbing a button and adding it to your blog, adding a link to your blogroll are ways to show other bloggers that you do read and enjoy their blogs. In my humble opinion a simple comment letting the blog owner know that you enjoy their blog and that you read it regularly, will mean so much more than an award being passed on. I have finally made a decision on this and my blog is now an Award Free Blog. Feel free to use this button for yourself if you'd like to join me. I agree wholeheartedly, Kylie. It's kinda nice to get them, but they're a poisoned chalice because they come with expectations and obligations. I agree that comments are the best awards a blogger can get! I agree completely, I don't put awards up either. Whenever someone "gives" me one, I thank them politely for their kindness/thoughtfulness/etc. and thank them for reading my blog and that's it. I don't put them up or pass them along. It's the thought that counts. I was thinking about this too lately. To me awards are almost like chain letters - sooner or later another one will arrive. While I do enjoy getting them, it feels sometimes like too much effort to put up a "thank you, let's pass the love" post. Essentially it's all marketing, and it's up to blog owners to decide whether you want to play this marketing game or not. I respect your opinion to opt out and a well thought out post. I think I'll have to snag your button. :) I have received 2-3 of these chain letter awards - and just smiled, and was thankful for the blog link. :) But this week - I got one from someone I REALLY admired - and somehow, the chain letter award had more merit. :) But - picking the people to pass it to . . . showed me how hard it is - this over that - so I passed it on to blogs that I wanted my readers to visit. I am totally with you on this, when I first started blogging the awards were something on the lines of tell everyone something they don't know about you and pass on to 3 friends, which I can cope with but now you have to write out your whole life history and pass of to 74 others and say why you love them so much. So, I have gone award free too, nice as it is to get one, I much prefer a comment or two. This has come up for me lately too, and I just received a couple more blog awards. I'm not big on passing them on either. And while I do think they have a little more merit than chain letters, I still choose to accept them gratefully and not pass them on. I have done so in the past, but I probably won't this time around. If I feel that a blogger "deserves" recognition, I will do so via email or in comments on their blog. Couldn't agree more Kylie. I think that blog awards are nice IF there are no strings attached for the reciever! Saying to someone 'oh here's an award for you, to collect it you must do x, y and z' doesn't really feel all that rewarding! ;) A comment on a post that touched you in some way is a much better reward! I'm not sure why I wasn't a follower before because I LOVE your blog...but...I am a follower now :) I agree with your post..I passed along my first award...and after that...not so much... but I do love getting comments (good ones)... Have a great day! Amen. We were appreciated but tired of the awards, so I did a quick google search to see if I could find a button to use real quick and you came up. :) Thanks. Well put! These "awards" strike me in a similar way as chain letters and forwarded email chains... not really my cup of tea. I have to agree with sbswtp - lovely comments from those readers are far more appreciated. I am about to become award free blog, may i borrow a few of your reasons, you said it so well, and put a link to your post under the award? give you credit? i knew how i felt but not how to say it. 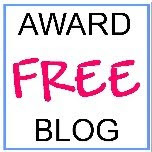 I searched on "award free blog" and found your button. Thank you so much. I really appreciate my awards but in order to find other blogs to sent them too I end up doing it very quick just to be done. I much rather like to make or recieve a comment, it´s more personal and that means that someone has read my blog. I have been trying to find and nice way of saying this without hurting anyone's feelings. when I starting blogging a couple years ago, awards were all over the place, then for a while nothing. Now they are BACK. Thank you so much I will be adding your button to my site. I just wanted to let you I added your button to my blog and linked back to you. Thank you so much for providing a "out" for these awards. They take up the time I'd rather spend writing posts. It's great that you did this. Thank you! Hello, Love this posting. Of course, as a new blogger who hasn't joined the hundreds of parties, I haven't received any awards and don't have many followers. I often wondered about those awards and why people have them plastered on their blogs. My best gift would be getting people to suscribe to my blog via linky followers, google or reader. I love getting comments. Comments are the best, because it means someone took the time to read what I wrote and thought enough to leave a comment. I wouldn't mind having my blog featured as a guest that would be kind of cool! I really like this blog but have noticed that you haven't posted in awhile. Are you still blogging? thanks for sharing,good article.I like it,I’m looking forward to read other articles. It kind of reminds me of grade school and getting picked or not getting picked for the team. I've never cared for them.